CINCINNATI -- It's pretty simple in basketball -- if your opponent can't get clean looks or easy layups and is forced into turning over the ball, there's a good chance you're going to win. That’s why field-goal percentage defense has been such a key stat for the Cincinnati Bearcats. Coach Mick Cronin’s squads have always been known for their stingy defense, but the ability to protect the lane and tie up the opponents’ best shooters has a lot to do with the No. 6-ranked Bearcats’ success over the years and especially through a 22-2 start this season. “It’s huge for us,” Cronin said. “We try to not give up layups. I know that's simple but … kids don't miss layups, they miss shots, so our thing is to not give up layups and we try to not let the best shooters shoot, and we're big on not giving up dumb fouls. We coach it really hard and teach it and review it on film. That’s how we do it. 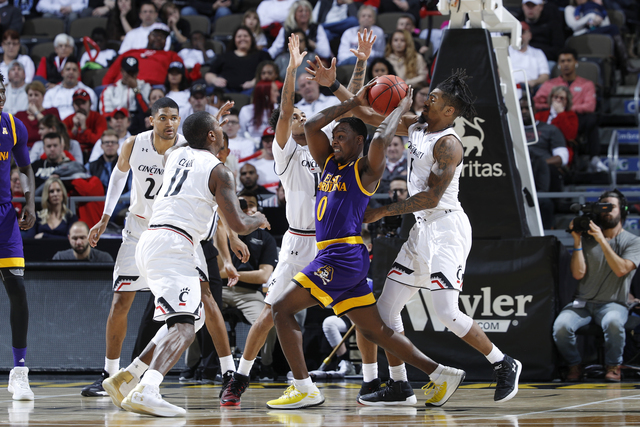 UC ranks second nationally in scoring defense while allowing 56.1 points per game, but the Bearcats have been in the top 25 of that category the past five years and six of the last seven years during the team’s current streak of NCAA tournament appearances. Their field-goal percentage defense also has ranked among the top 20 the past five years, staying under 40 percent each season, but that’s an area that just seems to be getting better and better. UC ranked 13th at 39.3 percent in 2015-16, ninth at 38.3 percent last season and second currently at 36.3 percent. Additionally, KenPom.com ranks UC second in adjusted defensive efficiency at .856 points per defensive possession, which is on pace to become the second-best in KenPom.com metrics dating back to 2002. The Bearcats have been in the top 22 of those ratings for eight straight seasons. UC gets it done defensively in different ways, playing a variety of matchup zones and man-to-man defenses with occasional full-court pressure. While trying to prevent layups, the Bearcats have been solid at the rim, ranking 12th in blocked shots at 5.6 per game, and they’ve displayed great help defense to shut down top scorers. Perhaps the best example of how UC wants to play on defense came Tuesday in a 77-40 win over Central Florida. The Knights made just five field goals on 19.2 percent shooting in the first half, including missing 14 shots in a row at one point, and finished with a 28.3 percentage for the game. Cincinnati didn’t allow a single 3-pointer in 14 attempts and surrendered a mere 18 points in the paint, while effectively trying to force UCF into long-range jump shots. It helps having some of the nation’s top individual defenders. Clark, the American Athletic Conference Defensive Player of the Year in 2015-16, anchors the team as a player who can defend all five positions. The 6-foot-8 power forward ranks No. 1 nationally among individuals in BasketballReference.com’s defensive ratings at 77.8 points allowed per 100 possessions, and four others are in the top 20. Senior forward Kyle Washington follows at No. 4 (83.7), junior guard Jacob Evans ranks No. 7 (84.9), sophomore guard Jarron Cumberland -- the team’s most improved defender, according to Cronin -- is at No. 12 (86.8) and junior point guard Cane Broome checks in at No. 17 (87.9). Cronin said he doesn’t recruit based on defense, though. That line of thinking comes from being around coaches like Bob Huggins, for whom he assisted from 1996 to 2001, and Rick Pitino, for whom he coached under at Louisville from 2001 to 2003. It even goes back to watching his dad, Hep Cronin, who coached him at LaSalle High School. Cronin said it takes certain kinds of players to be able to coach a team into great defenders. Another secret to success on defense is trying to keep the team experienced, Cronin said, because young players haven’t learned the difference between aggressiveness and over-defending or fouling at this level yet. It generally takes two years for players to learn how to defend on and off the ball at a high level, he said. Clark doesn’t doubt that he is a better defender because of his decision to play at UC. He knew Cronin was a defensive-minded coach when he signed with the Bearcats straight off Tobacco Road in Clayton, North Carolina. “I watch other teams play and they play defense, but coach used a saying when I first got here: ‘It's not enough to be on defense, you have to play defense,'” Clark said. “Everyone runs back on defense, but not everyone is locked in. I think the difference between us and other teams is all five guys are ready to defend, ready to help.